What do Procurement Execs at IBM, Target, Fujitsu, Toshiba, Bank of America, & Rolls Royce All Have in Common? 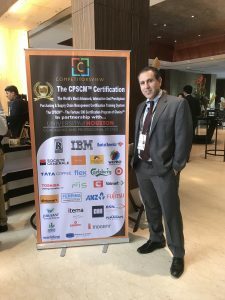 All of them and many more of the Fortune 500 flew in their top Procurement Executives to get CPSCM™ Certified by the Center for Purchasing and Supply Chain Management Excellence, in a 5 day intensive seminar taught just last week by THE Negotiation Godfather, Omid Ghamami, MBA, CPSCM. Only director level and above Procurement and Supply Chain Executives were in attendance to this invite-only strategic capability building event – 43 executives in total. Their firepower lit up the room. All 43 executives are now officially CPSCM™ certified and – as stated above – are ready to turn their Purchasing and Supply Chain Management Department into Value Added Centers of Profit. These are some of the most powerful movers and shakers I’ve worked with, and I learned just as much from them as they did from me. These rock stars are ready to go back and make a difference. I would also like to thank Competitors View for marketing this event and making it happen, and the prestigious University of Houston for making the CPSCM™ the ONLY Purchasing and Supply Chain Management Certification Program in the world that has been approved by a third party major university for issuance of program completion certificates. Purchasing pros, it just doesn’t get any better than this. Or does it? .… stay tuned and watch to see what’s coming. In the meantime, don’t settle for mediocrity. You’re going back to the same job, the same boss, the same customers, the same peers, the same everything. You either have established your corporate value and have a seat at the table with the C-Suite…. or you haven’t, and you are on the menu for lunch, every single day. What will you do different, starting today? Just remember: If you keep doing what you’ve always been doing, you’ll keep getting what you’ve always been getting.